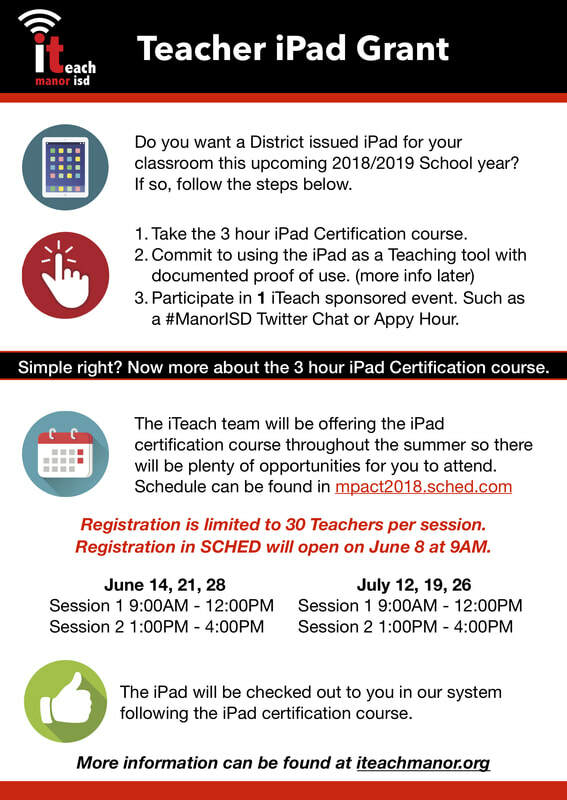 Registration for the iPad Grant sessions will open on June 8 at 9AM through the mpact2018.sched.com website. Once the session fills, you will be placed on a waiting list. Technology Services is revising optimal use of staff issued iPads. All instructional staff are issued a Mac Laptop but will no longer be issued an iPad as standard practice. iPads will be offered as grants to our teachers by completion of an iTeach 3-hour session offered twice a week during the summer and once a week during the school year. The intention of this procedure is NOT to sacrifice instruction, but rather to optimize the purposeful use of the tool. iPads that are collected and not needed for the iTeach grant will be used for classroom use by students. Teachers who take the 3-hour course in the summer and receive an iPad will be asked to document use of the iPad during the 2018/2019 school year. Documentation will be done through google forms provided by the iTeach team. More details during the 3 hour course. Teachers must participate in at least 1 iTeach event during the 2018/2019 school year as part of the iPad Grant. These events include the #ManorISD Twitter chat and Appy Hour event in the Fall. iTeach plans to host 4 Twitter chats this next school year and one Appy Hour event. More information will be given during the 3 hour course. The 3-hour workshop provided by iTeach will go over best practices with an iPad in the classroom. This includes may Teacher tools that are already being used and beyond. This course will also include a part of the Apple Teacher certification that is dedicated to iPad integration.